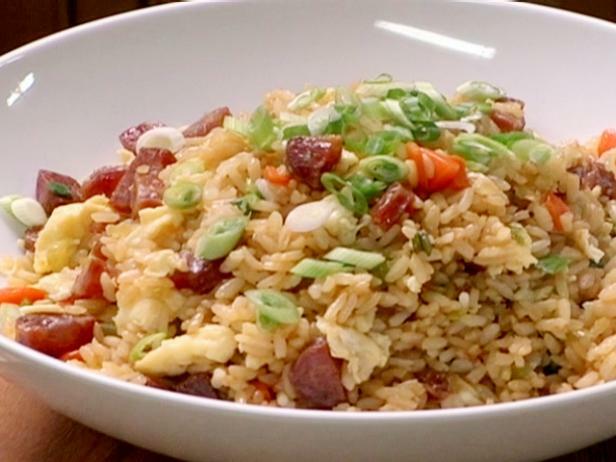 This recipe called for Chinese Sausage. I had a hard time finding them, and when I did - I didn't like what was in them - lots of sugar and preservatives. I substituted my homemade sausage patties recipe and this recipe turned out very well. Dovetailing Tip: Use the Homemade Sausage Patty recipe in place of the Chinese Sausages. Instead of forming the patties, crumble in a skillet and brown. Heat 2 tablespoons of canola oil in a wok over high heat. Add the beaten eggs and fry until they are fully cooked. Transfer them to plate. Add the remaining oil, ginger, garlic, carrot, and celery, and stir-fry for 2 minutes. Add the sausage and half of the scallions and cook for 1 minute. Add the cooked rice, soy sauce and rice wine vinegar. Stir-fry until the rice is hot, about 2 minutes. Stir in the reserved eggs and transfer to a serving dish. Garnish with the remaining scallions and serve.